As you might expect from a group of assistant professors, we were interested in figuring out his secret. The easy answer is that he’s simply better than most people at solving hard problems. Perhaps where you or I might get stuck, he, in a flash of Good Will Hunting-style brilliance, taps the chalkboard four times and the proof is solved. According to my colleagues, this star researcher tends to begin with techniques, not problems. He first masters a technique that seems promising (and when I say “master,” I mean it — he really goes deep in building his understanding). He then uses this new technique to seek out problems that were once hard but now yield easily. He’s restless in this quest, often mastering several new techniques each year. This sounds like an obvious approach, but it’s not. Most researchers are slow to adopt new bodies of knowledge — mainly because it’s really hard to do. This star researcher, by contrast, is much more nimble — jumping from technique to technique, finding improvements and making connections. What’s amazing about him, therefore, is not his ability to solve problems, but his ability to master things that are damn hard, damn quick. Here’s something I’ve noticed more and more recently: this ultra-learning strategy is common in people who do remarkable things. Richard Feynman, for example, used to brag about his ability to learn any topic in a short amount of time, a skill that led to one of modern science’s most breathtakingly diverse and important bodies of work. Steve Jobs spent his career diving deep into topic after topic in his field — industrial design, operating systems, 3D graphics — so that he could see clearly what was possible. Both of these hypotheses might prove false. But what’s true is that they’re both deserving of more exploration. Interesting hypothesis. Can you give any examples of the types of techniques that this star researcher mastered, which later led to great results? Would you elaborate on specific techniques that you witnessed or view important? This showed up in my RSS feed (via Barking Up the Wrong Tree): 20 ways to supercharge your ability to learn . Helpful. Techniques I find useful: Spaced Repition Learning, Memory tricks, modeling, ‘I watch you do it, you watch and correct me, I do it, I teach someone else,’ Mastering in chunk and increase in speed. However, I have not mastered any of those. It never occurred to me. Hands on professions, seem to be vigilant concerning technique (Chefs for instance). Whatever happened to deep focus? You just generalize from whatever convenient anecdote happens to be at hand. If a mathematician learns calculus AND set theory, is she disqualified from deep work? No timeframe was specified. You could spend a year on each and that’s easily within the definition of deep work. I’d be interested to have a few examples of what these “techniques” are. How can we identify them and go about picking them up? I thought anyone could achieve great results by just using the right techniques. Isn’t that a Study Hacks theme? Average intelligence can achieve was the smarty smart achieve but following some of your tips. I think what Cal’s trying to emphasize is here is that people who we claim are geniuses got to their levels by certain tricks/techniques that they’ve mastered over the course of time. Correct me if I’m wrong? New species of birds or animals. New languages. New connections between fields. New techniques within a field. New, new, new. This is absolutely rubbish. It’s called creativity. Taking abstract ideas and problems and regurgitating them into more concrete terms. Take Einstein for example. More than brilliance his creativity led to his outstanding success and results. It’s “rubbish” that hard work and practice lead to an increase in ability? We should just stick the label of “creativity” on it without any further explanation? This method seems to be seriously at odds with the normal funding process. How do these star-researchers get their money? Would you consider adding a thumbs up button to your posts? I get your articles in my email- and am pretty grateful. I don’t have much to comment regarding to your posts (for better or worse), but if I could show my love with a thumbs up- it could serve as a somewhat useful feedback tool for you. I’m pretty sure you’re into feedback, right? At first glance, there seems to be a bit of a contradiction here between your previous posts on narrowing distractions – e.g. ‘diversified’ studies and achievements – to achieve success within a particular niche? – Deep focus on a specific area of achievement (distributed algorithms research or environmental campaigning, for example) is necessary to make a remarkable impact. – Once this narrow field is established, the means through which achievement can be accomplished should be diverse, as that is the only way to make a remarkable impact and surpass the status quo. I’m intrigued too by the term “technique.” Also, what field are we talking about here specifically? Both of these must be detailed in another post. @Shuttle_Service that’s part of being focused: every topic you dive into is related to your work, and you’re only looking into them *because* of what you’re working on in the first place. I do feel very proud and so excited when seeing someone mastering some techniques around here and there in his/her field specialist interest. Sure, Mr./Mrs. so and so has mastered some tecniques in that field. Can you please specify and identify those techniques to me because may be I will follow his/her footsteps at the University of Liverpool where I’m now undertaking the MSC in Internet Systems Programme. Something that is more likely than not overlooked in regards to this article is the confluence of certain human characteristics in this “star researcher”. Humans are riddled with biases, one being the belief in one’s own sheer will and might being the sole cause and impetus for ones success and outcomes. This may be a third person version of this particular bias, as the “star researcher” is not speaking for him/her self; but the inverse of this bias is also blaming any one particular person for the reason for their failure. This type of bias is one of the most pernicious and vile, as it is a primary actor in the most heinous of human characteristics, supremacism. It is a characteristic that is quite prevalent in many countries, including and possibly foremost (currently, with significant consequence) the USA. The successful examples of ultra-learning that I’ve observed have all been when it’s applied within a particular area of long term focus. The researcher I mentioned, for example, used it to continue to learn new techniques relevant to his niche of applied mathematics. I think @tyz, from above, summarizes this point well. It’s called creativity. Taking abstract ideas and problems and regurgitating them into more concrete terms. Take Einstein for example. More than brilliance his creativity led to his outstanding success and results. Ultra-learning fuels creativity. Einstein’s work is profoundly creative, but it depended on his ability to quickly master difficult new techniques. You cannot have general relativity, for example, with Reinmann Geometry, which Einstein was willing to go master, even though he really did not like abstract mathematics. In other words, the more you’re able and willing to master cutting edge knowledge within your pursuit, the more creative and impactful outcomes you can generate. Would you consider adding a thumbs up button to your posts? Do you mean like a Facebook thing? If someone could point me toward a link about adding something like this to a Word Press blog, I’d be happy to try to set it up. I thought anyone could achieve great results by just using the right techniques. Isn’t that a Study Hacks theme? More or less. Mastering the art of rapidly learning valuable knowledge is one of those techniques that can lead to great results. I’d definitely like to write some more detailed posts in the future, as I explore these ideas. In terms of this researcher, here’s an example of something he did. 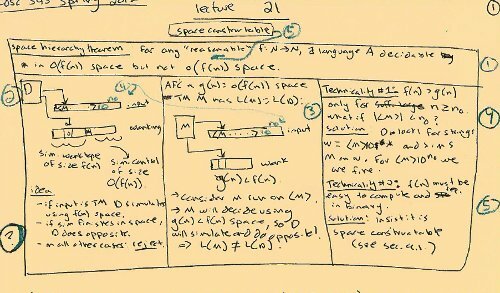 There was a mathematical technique that had been developed by a more practical corner of computer science. It had lead to lots of cool new results and systems, but the mathematics being used to apply and analyze it wasn’t particularly nice. This researcher, being a more pure applied mathematician, built a nuts to bolts understanding of how the technique worked — along the way, really simplifying things. At last count, he has generated 8-9 papers that leverage this deep understanding to improve existing results or apply the technique to new settings and get new results. This will sound like bragging to people who don’t read closely (and judging from the comments, that’s common). Please don’t take it that way; this is just my view on Cal’s observation. I’m no genius. I might cop to having a somewhat above-average intelligence and an “aptitude” for computers, but otherwise I don’t think I stand out from the average guy. That said, I do have a reputation at my job for designing and writing software solutions more quickly and thoroughly than the average developer. When colleagues ask me how I do what I do, I tell them it’s the product of having no life. While that’s a bit hyperbolic, I do try to practice a principle similar to the one Cal describes in this article. I spend a lot of my own time learning new design and programming techniques from as many different applications and programming languages as I can find, then I find ways to integrate those techniques into my day-to-day work. Sometimes they’re useful, sometimes they aren’t, but the net increase in experience is always helpful, and that experience can often provide the impetus for an “A-ha” moment when I’m faced with a stubborn problem. What I notice about the less-productive developers I’ve encountered is that they’re rarely stretching their technique. That is, they have a hammer in their development toolbox, and every development problem they see is a nail. These developers are every bit as intelligent as the more-productive developers (occasionally more so), but their unwillingness to broaden their repertoire of techniques hinders them. Thanks for this article, Cal. Do you still practice this learning of new techniques? Could you share some of new findings? What is your approach to finding sources for new things to learn? How does the ability to master damn hard things damn quickly differ from the ability to solve problems? Isn’t a technique unknown to me a problem to be understood and solved? And don’t people have differing abilities to master new techniques (similar to Good Will Hunting’s superior problem solving abilities)? In the first part of this post you speak of techniques, and then in the second part you speak of topics. Are these the same? I thought you were arguing that a technique is a way to master a topic, but now I’m not sure. The most popular plugin that integrates a variety of social media sites is probably ShareBar (popularized by being used on Mashable). Not sure what SEO plugin you use either but if you use Yoast SEO (used by Mashable and easily the best SEO plugin in my opinion) they have very well done integration features with Facebook and Open Graph. WOW. This is a great post as it speaks to my journey of the past 5-6 years. As a management consultant in a 19 year practice I have developed a wide toolkit of techniques. But in the last 5-6 years I have focused intensely on one area – individual time management. My blog speaks for itself — http://www.2time-sys.com — but what’s remarkable is that I struggle to find “company.” I constantly wonder why I am so way out on the skinny branches of my discipline, which is still stuck in some very dark ages due to the lack of a home in academia, and the resulting lack of research. For a field that impacts every working professional on the planet, every day… well, I remain astounded each and every day that the field is so undeveloped! I have indeed developed techniques in the way you described – in my case, I teach people to see how “time demands” flow through their lives – and it has lots of applications e.g. to email software design. I also search like crazy for fresh thinking in all disciplines that I can use to help understand the problem with fresh eyes. The most recent research on habit formation has been useful, for example. customized time management methods – an idea that might sound obviously true, but has little acceptance among the influential few in the field who prefer “one-size-fits-all” thinking. An HBR article from this month made the same point when it comes to leadership… so I am borrowing a “technique” or two from there. Thanks Cal — great article. I admire your blog, and enjoy your infrequent forays into time management topic too! Could we could up with some sort of optimization or ecological interpretation? At any given moment, new circumstances or data or ideas are opening up fresh areas to explore for new results; but also at any given moment, old areas still have new results that could be found if one were to look. So one faces an exploration vs exploitation tradeoff: explore new areas or exploit old areas. One’s rivals face the same tradeoff, and will naturally adopt some sort of mixed strategy – doing a little exploration for the novelty or because it seems particularly valuable, but also doing a lot of exploiting in ‘safe’ areas. So does this imply that there are unoccupied niches for extreme explorers or extreme exploiters? What predicts whether one will do better exploring or exploiting? Just faster learning? Yes, you can hand-wave that this researcher is focusing on “a specific area of achievement” (whatever that is supposed to mean) relevant to his field. Look at the examples – Feynman and Jobs. Especially Jobs. Jobs was the quintessential jack-of-all-trades-master-of-none (okay maybe master of some) – specifically what this blog tells high school students not to do. There is a tendency to generalize from one successful example. It doesn’t work, I’m afraid. Doesn’t this go against your emphasis on taking just 1 major in university? Your posts seem to go against Generalists while this Ultra-Learning Hypothesis would seem to support them. I see Steve Jobs as a Generalist while Steve Martin a Specialist. Does this hold true in Lieberman’s case as well? You said “simple”, which implies that one didn’t necessary need to “know” much to publish what he did. This might be convincing if you had more data. I don’t think it fits the pattern I’ve seen in my field. There are lots of exquisitely wrought hammers out there pounding on lots of boring nails. What’s relevant is that you say he is making important contributions–this implies he is choosing to work on important problems. It’s not surprising that he is applying new techniques to solve them. If the techniques weren’t new, the problems would have been solved already. At least he’s learning new methods. No one like an n-trick pony. For a problem, the answer is as yet unknown to the world. For a technique, there’s nothing left open, it’s just hard knowledge to be learned. Doesn’t this go against your emphasis on taking just 1 major in university? Ultra-learning seems to work best within a given area of focus. My case study, for example, is a theoretical computer scientist and all of his techniques are within this field. There are lots of exquisitely wrought hammers out there pounding on lots of boring nails. This is interest to me. In your field, what seems to make the difference between those who get good hammers versus bad hammers (to carry your metaphor a touch too far)? Is it the nimbleness of people like Erez that allow them keep sifting out good hammers, or is there a skill in choosing which hammer to develop? 1. On a recent post you said “Over the past year, I’ve been systematically increasing my pace of skill learning (more on this soon)”, are you focusing your learning efforts on techniques, like the person in your case study? 2. Will the methods you’ve been using to increase your pace be discussed in the upcoming book? To me, Cal is a genius. Whenever I read his blog, it put me on a very different mode, immediately my brain start operating… Million thanks and wish you all the best! May God bless you! Great post! Breakthrough work in any field often involves making new connections using a variety of “old techniques”. Using the craft of quilting as an example – in the late 1970,s – early 80’s there was interest in reviving many “old style” crafts – and quilting was one of them. The first few years (perhaps a full decade) the interest was to understand and recreate old quilts and cotton was the only material deemed appropriate. As quilting entered the 1990’s an interest in combining other “old time” crafts, such as dyeing fabric and embroidery was added, as well as new sewing machine skills to create old fashioned looking quilts. By the year 2000 the art quilt movement was starting and suddenly wall quilts became a real focus – by 2005 many other craft disciplines (such as metal working and beading) and newly developed fibers moved much of quilting into a true art form. Point of the story? We can only come up with new connections in any field if we become familiar with knowledge that may be related to our area focus- but not necessarily an accepted part of the body of knowledge in that area. Focused dabbling may well be a key to many new discoveries, in many areas of knowledge. Cal – this is really interesting. It took, however, reading the comments, to get a better handle on what was meant by “technique” as I’m a humanities student. I think this is because these people in these fields are encouraged to develop a unique voice within their work. Although learning a variety of difficult techniques is a powerful skill, that may not be enough to make an impact. The second ingredient to this theory could be using your unique voice to unify diverse techniques into a meaningful body of work. Albert Einstein, for instance, did not know more physics or mathematics than his less illustrious colleagues. Indeed, he often exhibited less expertise. What was crucial was not how much he knew, but rather how he organized his knowledge, including how that information meshed with a distinctive style and worldview. Nice article. I absolutely agree with the need for being able to learn different things quickly. Not only does it help you see the connections between fields, it also makes life much much richer. However, I would caution against trying to learn too many things at once and not mastering any of them. An obvious advice for those who regularly visit this blog, but one that is often overlooked. When it comes down to it, I think dedication and focus should come first. Breadth can come later when you’re already an expert in one subject. I think that the process explained in the article, is a concrete method to follow in order to understand complicated concepts. It’s amazing how two different approaches on mastering a subject can have so much in common. Cal, Not in response to your observations about ultra-learning and technique, but nonetheless relevant to impact, do you understand–I do not–exactly how Elinor Ostrom won the Nobel Prize in Economics? She was NOT an economist by training, she was a political scientist, she was credited with being an iconoclast, and she studied how people put together local organizations in different societies. One of my own theories, noted above, is that researchers tend to get gratifying results when they apply known categories to new areas, new species, new languages, etc. Or when they ask new questions about old areas. Perhaps another reader knows exactly what Ostrom did. The title of your blog post is contradictory to the content of your post. If your talented colleague did not map the newly learned technique onto a receptive problem (i.e. done something with it) then it most likely would have been lost to posterity unless he/she would have written about it. Actionable knowledge is always more valuable than knowing without following up and doing something (of value) with it. All it takes to accomplish these results is to remember what Einstein once said – Imagination is more important than knowledge. What he meant is knowing is not enough, for to begin to know is know that you do not know. Optionally, one can choose to apply their imagination to knit together disparate pieces of information to apply their newly found knowledge to achieve new results. The art is in the choosing! I am a fast learner. I learn the things I need in my life – various ways with fb, forensic accounting for my divorce settlement (!) and have a working assumption that no matter what I am learning, it will have relevance to my other areas of interest, no matter how seemingly unrelated. And this assumption usually proves true! What I mean is that many of the highest-impact papers in computational biology aren’t about brilliant new methods. They’re often about rather straightforward (or slightly novel) methods applied to important new datasets, or they’re basically arbitrage: traditional methods from subfield X applied to subfield Y. Occasionally, they’re a clever new framing of existing questions. It can take a long time to sort out the flashy cool new arbitrage from the stuff that really changes a field. Some people like developing methods, even if this means they’re working on esoteric or non-yet-extant problems. Others prefer focusing on interesting problems, perhaps at the expense of rigor or depth. Each is rewarded differently by publishers. The methodological advances are almost never splashy, and some of the most important conceptual developments take years to realize. Perhaps the most important concept in ecology in the past 30 years–the neutral theory–was first published 10 years ago in a journal on coral reefs because no one else would accept it. A corollary is that many people, *especially* those not in a famous person’s primary field of study (who might nonetheless be reviewing his/her grants or choosing plenary speakers), will never realize that famous person’s brilliant idea from 5 or 10 years ago never actually panned out. You talk a lot about Nature/Science papers and HSF. Many important findings get published there, but I don’t know if you appreciate the enormous amount of noise. Nature and Science are well known among biologists for being the only gatekeeper journals with non-academic editors. This means there can be a lot of luck and whim in what’s deemed exciting and important. Re HSF… I don’t think you’ve investigated the selection process. I’d make this comment less rambling, but I have to get back to research. What I’m saying is that I think you’re fixating perhaps too much and too deterministically on one sample, and you’re ignoring interactions with the environment (i.e., professional context). This isn’t to knock Erez at all. He’s awesome. It’s about your analysis. Personally, I’ve always been wary of “absolute focus”, that is, a sort of “focus” where there aren’t any sub-divisions. Thankfully, in reality, there isn’t any sort of said focus. To give a metaphor, I like to think of focus as a narrow beam of white light. But remember, white light is composed of varying light of various wavelengths and frequencies. Very interesting thought Mary Campbell Gallagher, J.D., Ph.D, now I can go back to my work. Einstein – what a guy! Computational biologist, people like you are the reason I come back to this site every couple of years. I’ve long suspected publishing in science to be in line with what you have described. There is a lack of cynicism in Cal’s posts with respect to role of social politicking/market awareness when it comes to getting anywhere in academia. How exactly should I apply the ultra-learning hypothesis as a freshman? Should I invest time learning lots of courses related to my major or just focus on my CGPA? I’m currently experiencing the disadvantages of this idea: My PhD supervisor wanted me to learn a certain technique to prove certain results, but every time I apply this to the set of problems we are interested in, I don’t get a satisfying result. All I did the last year was playing around with this technique, but I could prove almost nothing. I feel like I wasted a year. Also, I didn’t learn that much apart from this one technique. Any ideas on this or on how to act in situations like these in the future? Popular research does not equate to meaningful research. From a medical standpoint, two of the biggest medical breakthroughs of the century: The Philadelphia chromosome in CML and H. pylori as the cause for gastric ulcers, were first published in throw-away journals decades before anyone considered their utility. Erez may be brilliant, he may be a great mathematician, but doing those things alone do not guarantee one publishes in Nature. Politics plays a role too. One must first find people that one wants to become like, and then make one’s self like that so that they feel as if they relate to the person. Social molting, or something like that. Surrounding one’s self with the right circle of people appears to be the rate-limiting step. I like this site very much, Its a rattling nice billet to read and get info . “Philosophy is a battle against the bewitchment of our intelligence by means of language.” by Ludwig Wittgenstein.